alien trilogy (VHS) - Collected It! Is this item correctly described? Is this item already in this or another category? Is this item a variation on on existing item? Anne Morgan (210) updated the description (changed). Anne Morgan (210) updated the description (Initial submission.). Anne Morgan (210) added the picture alien trilogy. 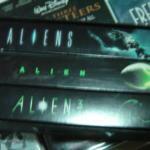 Anne Morgan (210) submitted the collectible alien trilogy.